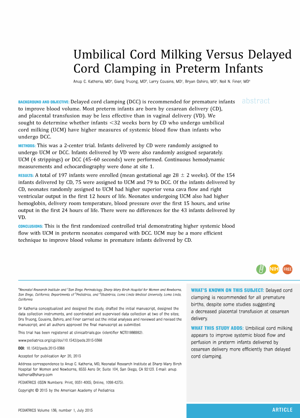 In a recent article in Pediatrics, Dr. Anup Katheria and co-workers reports on a randomized trial comparing umbilical cord milking (4 times stripping) and delayed umbilical cord clamping (45-60 sec) in 197 preterms. Among the preterms, Katheria & al choose to emphasize the findings from a large sub-group in the trial, those born by cesarean delivery, Out of 154, 75 were assigned to milking and 79 to delayed clamping. There were no differences between the two groups among infants born vaginally. Among those born by cesarean delivery, umbilical cord milking resulted in higher hemoglobin, delivery room temperature, blood pressure over the first 15 hours, and urine output in the first 24 hours of life. No differences in in cerebral saturations or impedance-derived cardiac output or stroke volume were seen between the infants. The interesting finding that milking would provide a larger placental transfusion of blood to the preterm newborn is also open for some questions. The authors do tell us that delaying for 45 seconds is quite a long time for a preterm trial, but you might always wonder if delaying for a longer while would have ameliorated the differences shown? We are also starting to be more observant on initiation of breathing and placental blood flow (by the research of Stuart Hooper & al) – implying that it is preferable to wait to clamp the cord until after the baby has started breathing or positive pressure ventilation is provided – I can’t find any data on this in the article. 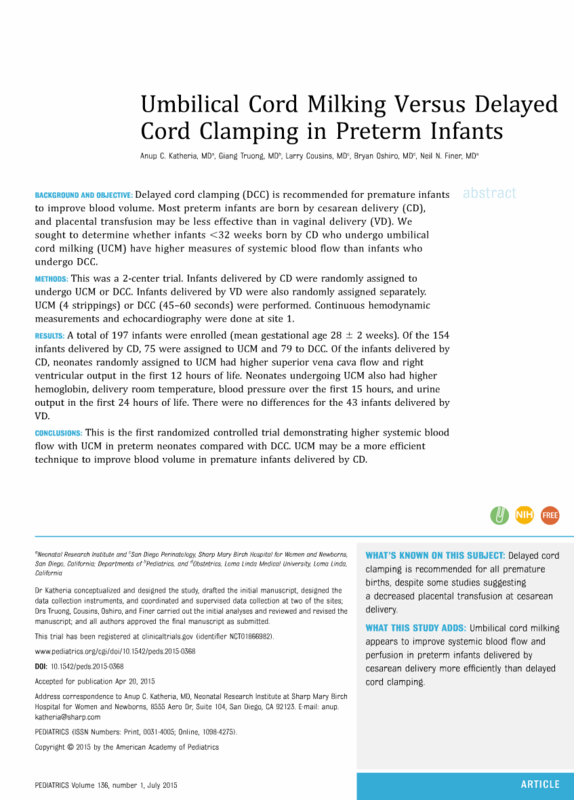 Recently a study including 67 preterms (< 32 weeks) comparing delayed clamping for 30 seconds with adding milking 2 times after 30 seconds of cord clamping couldn’t show any additional effect. Also, in 2011, Rabe & al compared delayed clamping after 30 seconds with milking 4 times and did not show any significant differences among the included 58 neonates. Gradually, and in many peoples opinion, too slowly, we are learning more and more about the effects of waiting to clamp the cord and/or umbilical cord milking. It is believed that the most vulnerable newborns 8the extremely preterms and those undergoing asphyxia) are the ones who might profit the most of these methods, and more and more data is confirming this. Still, it is clear that more studies has to be made to help us understand the physiology of what happen with the placentas and babies circulation at birth under different circumstances. After cesarean delivery, umbilical cord milking might provide premature babies with a higher blood volume than delaying to clamp the cord for approximately 45 seconds.